Composer Bear Series MUSICAL German Mohair Teddy, fully jointed. With Musical Movement that plays the melody "Brahm's Lullaby". BRAHMS 1833 - 1897 European Edition. A beautiful Collectible Teddy Bear from Germany. 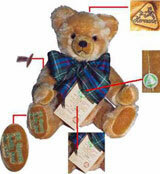 HERMANN-Spielwaren is one of the oldest still existing Teddy Bear companies in the world. Founded in 1920, the company is world-famous for their craftmanship, extraordinary designs, exclusive small editions and that every bear, hand-made in Coburg, Germany has its own personality. Each is made by highly skilled craftsmen and women and they have won many prestigious Awards, including the TOBY, Golden Teddy and TED Award. Limited Edition of 500. Musical Mohair Teddy Bear with excelsior filling, 40cm. 15.75 inches tall. Plays Brahm's Lullaby.